In breaking SEO news this week, keen-eyed searchers have spotted Google testing auto-play videos in the search results. User’s who are part of this experiment will find videos auto-playing in the knowledge panel. The knowledge panel is a box that appears on the right-hand side of the search results and contains essential information about your search topic. Google has confirmed they are running an experiment that will auto-play videos for a small number of users, but they haven’t yet announced when or if this will be rolled out to everyone. With video content now growing as fast as it is, it’s only a matter of time before Google further optimizes the search results for video. Have you noticed any other Google experiments lately? We’d love to hear about your experiences in the comments below this video! You can now link Facebook Groups to your business Facebook Page via a brand new feature called Groups For Pages! Facebook Pages are the official profiles for celebrities, brands or businesses. Facebook Groups are a place for group communication and for people to share their common interests, express their opinion and be part of a community. Linking the two is as simple as logging into your business's Facebook Page, clicking on Groups and then ‘Link Your Group’, Selecting the Group you want to link to, and then clicking ‘Link Group’. As we reported a few weeks ago, Facebook has over 2 billion active monthly users, so it’s important that your business has a presence on Facebook. Linking your Page and Group together will help to build a community around your business or brand. If you want to see an example of how this works, head to facebook.com/ContentSamurai and click on the Groups tab. Fast forward to today, and Google is once again taking the fight to Facebook! This time around, they’re launching a personalized ‘news feed’ service for their mobile app. 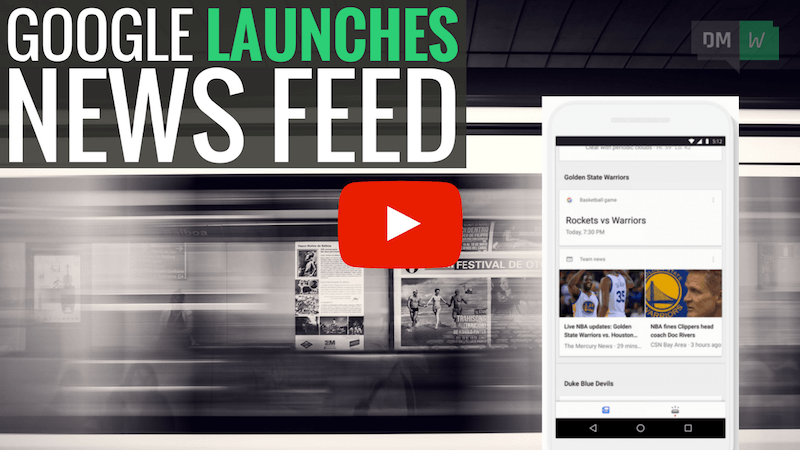 The Google news feed will be similar in style to the Facebook news feed. It will display a personalized feed of videos, news stories, and music, based on previous searches by the user. Users will be able to add topics of interest to their feed by clicking a ‘follow’ button on search results. Perhaps the most exciting part of this is the high probability that Google will insert ads into the news feed. Google hasn't leaked any details about ads in the news feed yet, but many experts are saying it will only be a matter of time. Having your ads in Google's personalized news feed could be a highly profitable advertising platform for your business...so we'll be sure to let you know as soon as it happens! The Google News Feed is currently only rolling out to mobiles in the US but is expected to start rolling out internationally in the next few weeks. If you’ve already seen it, let us know what you think in the comments below this video.